Impressions of New York – Let's Go RVing! Previously when I heard the words New York I always thought of New York City and the various other cities one hears mentioned occasionally but to my amazement New York is so very much more. In the first place it’s a large state so there must be more there than just those few big cities we hear so much about. Right? Right! It is the beautiful Finger Lakes region and much, much more. Whether you want to take the winery trail, the cheese trail, the outlet trail or just bounce along putting over 800 miles on your car in less than two weeks, there’s something for everyone to see. The state parks are incredible each one more outstanding and magnificent than the other. The western part of the state has numerous state parks – just take your pick! We started with Letchwworth State Park in Mt Morris and it surely lived up to its name of the Grand Canyon of the East. It was also voted the #1 State Park in America in 2015. We also got to have lunch at Buttermilk State Park outside of Ithaca and then briefly visited the falls at Taughannock State Park. We topped it off with a visit to the very incredible Watkins Glen State Park. Oh what beauty God has given us. Leaves are beginning to change although the vivid reds and oranges are not at their peak yet but we still saw stunning views nearly everywhere we looked. As a born and bred southerner (and proud of it) I guess we were a bit apprehensive about coming to the big state of New York – to Yankee Land! People couldn’t have been nicer from the several check out girls we saw in the grocery store to the office staff at the campgrounds to the various people we met everywhere. There surely was a lot of southern hospitality very evident in this northern state. 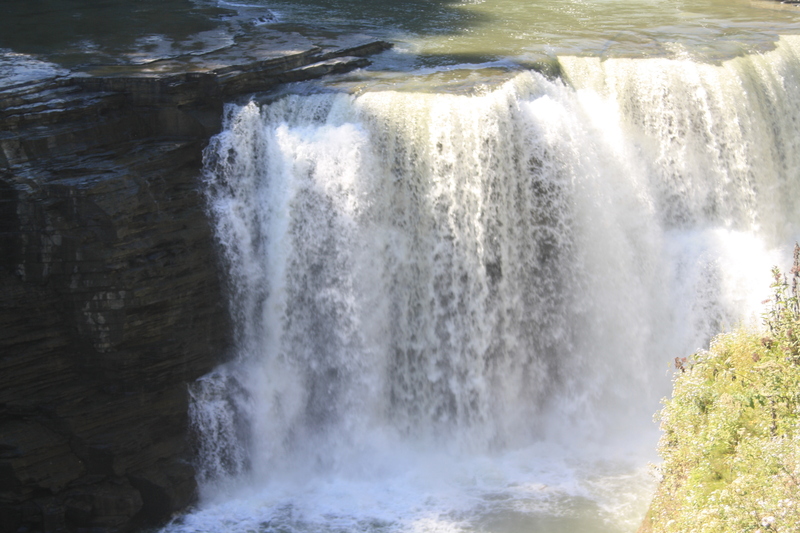 If you have not been to western New York go – you will not be disappointed! Can’t wait to visit the other parts of the state. Yes, Gale…New York is a wonderfully diverse state. Some of the best natural experiences in the northeast are found there. And if you like the city itself (which we do), it is possible as an RVer to explore it. We camped at the KOA in Newburgh and rode the Hudson River Line in from Beacon. We did that for three days in a row and loved it. At the time, we had two dogs…and the KOA had a dog walker who let them out and fed them for a donation to the KOA camp for children with cancer.